I read POPSUGAR's article about Haku Smoked Shoyu while researching Chinese soy sauce brands in America because I could not find my favorite Singapore label Kwong Cheong Thye in any of the supermarkets here. The smoky shoyu in an elegant glass bottle with artwork that reminded me of Hanyu and Karuizawa whisky labels piqued my curiosity so I looked up Haku Shoyu. Two out of the four flavours caught my attention: (1) Mizunara Whisky Barrel Aged Shoyu and (2) Smoked Shoyu. Haku Shoyu's average price of US$ 25 compared to Kikkoman's Premium Sushi & Sashimi Shoyu at US$ 4 seemed like an extravagance best reserved for special occasions. I put off buying them for months before splurging on two bottles of Haku Shoyu and a bottle of Takuko Sashimi Tamari as a birthday gift to myself. Shortly after I bought the bottles of Haku Shoyu and Takuko Sashimi Tamari, Wegman's had a Sushi Fest at the Fairfax location, which was pretty close to my home. It was the perfect opportunity for me to buy Japanese farmed tuna sashimi to run the taste test since there aren't any Japanese supermarkets like Meidi-Ya or Isetan in the area. I've been told that Wegman's is one of the best places to get quality sashimi-grade fish in our neck of the woods so I guess I'll be back more often when a sashimi craving hits. I couldn't get any Otoro (fatty tuna) as they'd all been snapped up by the people before me so I had to settle for Chu Toro (medium fatty tuna), marinated Ikura (salmon roe) and a fresh wasabi stem which I grated using my Kyocera ceramic grater. How did the artisanal bottles of shoyu measure up in the taste test? 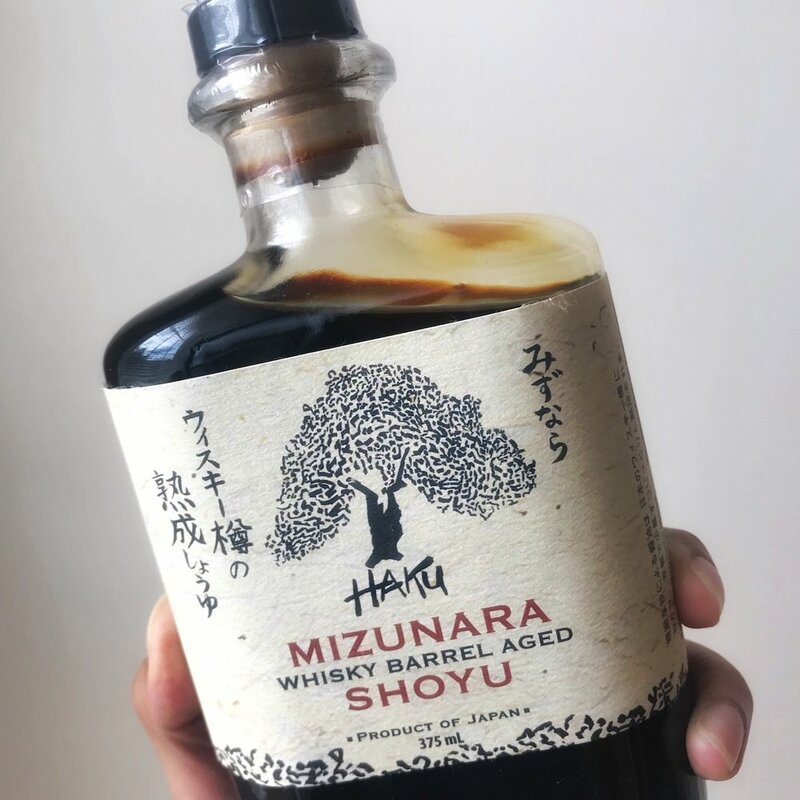 There are a few online shops such as Umami Mart that sell and ship Haku Mizunara Whisky Barrel Aged Shoyu in America. I bought mine via Amazon Marketplace because I was comfortable with the customer support that they've provided so far. Haku's naturally-fermented shoyu are brewed by master craftsmen using the traditional 250-year old mushiro koji method of layering soy beans applied with koji mold on bamboo and rice straw mats in Kyoto prefecture. It is then aged in whisky barrels made from Mizunara hard wood, a type of Japanese oak that lends a sandalwood flavour to fine Japanese whiskies. The end product is a mellow shoyu with a touch of sweetness. I enjoyed this delicately-flavored soy sauce with well-rounded finish and a hint of whisky flavour without the burn of alcohol. It reminded me of desserts with a hint of flambéed whisky. As the shoyu's flavour is rather mild and sweet, I thought it might go better with more delicate tasting fish such as Hirame (sole), Tai (red snapper), or sweet creamy Uni from Hokkaido (sea urchin) and lobster. 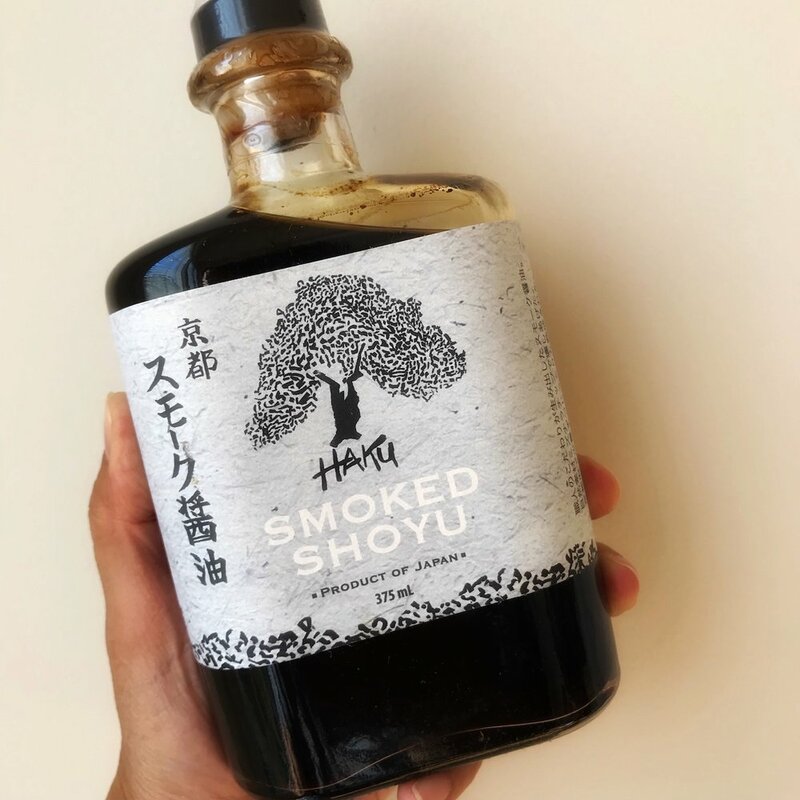 I bought this bottle of Haku Smoked Shoyu from Marx Foods as it was the least expensive vendor and I wanted to buy some other items from them. Brewed using the mushiro koji method then aged, the master craftsmen used the Haku family's unique cold-smoking process and Mizunara hard wood to impart a smoky flavour to the soy sauce. The smoked soy sauce reminded me of Katsuo Tataki (bonito grilled over straw fire). An umami bomb that isn't too salty, I thought it was perfect with Chu Toro, Ikura and steamed rice. I haven't had tamari since savouring it in some of the vegan dishes I had at Fivelements Puri Ahimsa in Bali a few years ago. Brewed using traditional methods in Osaka, Takuko's Sashimi Tamari Shoyu was mildly flavoured. I thought it had a slightly tangy finish that reminded me of ponzu (citrus-based soy sauce). The clean flavour of this tamari went well with the Chu-Toro. It's wheat-free so it's a perfect soy sauce for people with wheat allergies. It's also a less expensive alternative to the two bottles of Haku Shoyu as the average price is about US$ 15. 1) Haku Smoked Shoyu was my favourite complement to the Chu Toro as it lent a smoky flavour to the rich, fatty fish. 2) Takuko Sashimi Tamari Shoyu's clean taste was a perfect complement to the rich flavour of the fatty fish. 3) Haku Mizunara Whisky Barrel Aged Shoyu was a little too subtle tasting for the fatty fish. 4) Kikkoman Premium Sushi & Sashimi Shoyu was the saltiest of the four bottles. It seemed to lack the complexity of flavours offered by the artisanal bottles. After savouring the artisanal shoyu, I think it's worth spending more for health reasons. The complex flavours were also more satisfying than the relatively one-dimensional saltiness of regular shoyu. Inspired by Bantam King's rice with chicken drippings, butter and shoyu, I tried making a butter-free version with fried egg, fried chicken skin and Korean-style roasted seaweed at home. The smoked shoyu added a lovely flavour to the fried egg and rendered chicken fat drizzled over steamed rice. The seaweed that had been roasted with sesame oil and sea salt didn't complement the other ingredients so I'll omit that the next time I make this. Though the runny egg yolk served as a "sauce" of sorts, I think the rice bowl would taste better with a slab of creamy butter. * PS: This post is not sponsored. I may receive some remuneration (at no additional cost to you) from Amazon if qualifying purchases are made using my link, and if Amazon adds me to their affiliates program after 180 days.